We're a quarter of the way through the year, so it's time for another one of these posts. Let's see what I viewed this past April. The Greatest Showman [rewatch] - 4/5 - I'm glad to have seen this on the big screen once more. A visually vibrant musical which is certainly flawed, but full of catchy tunes and wonderful choreography. Toni Erdmann - 4.5/5 - What Maren Ade has delivered is a near 3 hour film with no flab, where every scene feels completely necessary, be it to the plot or the characters. Front and centre lies a wonderfully realized relationship between father and daughter, as he wants to inject some happiness into her work heavy days, in his own unique way. But he also just wants to be a part of her life, while she just feels embarrassed by him. Both Peter Simonischek and Sandra Hüller do wonderful work in their roles, selling every aspect unbelievably well. Be it hosting a unique party, or wearing false teeth and a wig, these moments are grounded in emotional truth which leaves viewers to completely understand their actions. A lesser production would've tried playing these moments for over the top laughs, but Ade thankfully avoids these tropes. A Wrinkle In Time - 4/5 - Maybe i'm just a sucker for high bouts of imagination, but I really enjoyed what I witnessed here. What Ava DuVernay has brought to screen is an imaginative and visually vibrant piece of work that swept me along with ease, powered by tremendous performances (especially the wonderful find that is Storm Reid). Yes, the script has notably weaker elements, particularly how the end seems to just come to a halt, and how we didn't exactly need all three of the Mrs characters to be there. But I felt the ideas, such as flowers speaking in colour and Reese Witherspoon transforming into a giant lettuce monster, were so wonderfully done, I ended up loving what I bore witness to. Starship Troopers - 4.5/5 - Paul Verhoeven takes a typical science fiction action scenario, depicting mans war against giant bugs, and uses the opportunity to deliver a strong satirical element. It helps that the characters are well formed and the action is compelling, but the satire elevates things, thanks to how wonderfully Verhoeven handles this aspect. Captain Underpants: The First Epic Movie [rewatch] - 4.5/5 - I took the opportunity to share with my brothers this wonderful animation about two children who hang out with a hypnotised man in his underpants. We bonded over the Tattle Turtle, the use of flip-o-rama and sock puppets, and especially the laugh out loud instances of humour. I do certainly hope we get a worthy sequel, with more fantastic Weird Al songs. Midnight Sun - 3.5/5 - Scott Speer delivers exactly what you expect from this. Another entry into the romance genre, where one character suffers from a severe illness, it follows the typical formula, which includes questionable decisions to keep said illness a secret. If you go along with the film, you'll be rewarded with an engaging romance between two likeable leads, with Patrick Schwarzenegger being the spitting image of his dad at times. The fun and humorous moments carry the picture just as much as the emotional and saddening ones, but because of the likeable performances, it's easy to go along with the cliches, from beginning to end. Frankenstein (1931) - 4/5 - I can't claim to have read Mary Shelley's original text, so I cannot comment on how faithful James Whale's film actually is. What I can say is how the film breezes by, with the 71 minute runtime being wrapped up before one knows it (perhaps a bit too neatly though). It's a tale that proves compelling throughout, while packing effective bouts of horror and suspense. At the centre is Boris Karloff, whose portrayal as the creature is rightly considered iconic. An innocent who does not understand the weight of his actions, but lashes out on those who hurt and fear him. A Quiet Place - 4.5/5 - Between John Krasinski and Jordan Peele, there's a strong argument for comedic actors being able to deliver strong horror films. 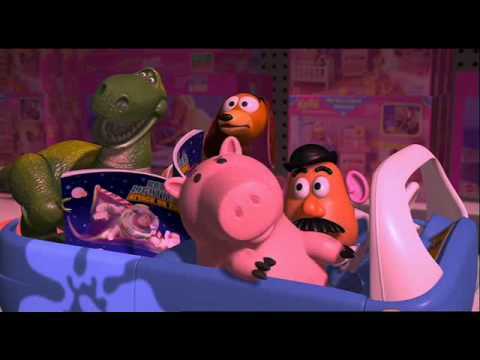 Toy Story 2 [rewatch] - 5/5 - It still amazes me that Pixar managed to hit a home run with this, a masterful sequel to an already masterful film. The gags land, the heart is undoubtedly there, the characterisation is really well done, and the voice acting is on point. This is as wonderful to watch aged 25, as it was when I first saw it aged 7. The Thing From Another World - 2.5/5 - I can't say I'm familiar with the original story "Who Goes There? ", the extent of my knowledge lies with the following two films which were both named The Thing. Christian Nyby's tale has moments which thrill and intrigue, but I found it difficult to get invested in this story. For one, none of the characters proved interesting, or well developed. Even the ones where some character attribute was attached just felt like bland archetypes, be it the love interest, the reporter, the mad scientist, or even the dull lead. It's a tale which didn't work for me. The Woman In Black (1989) - 4/5 - In an effort to catch up with The Evolution of Horror podcast, I put off The Woman In Black episode until I had viewed both adaptations of the story, and it'll be tough for the 2012 film to top this one. I remember watching this 1989 TV movie in English class some years back, but recall nothing except that ending. My intial impression is how effectively this gets under ones skin thanks to the mood and atmosphere, both of which are phenomenally delivered. Andrew Rawlings does well in portraying Arthur Kid, an aspirational family man who's thrust into a nightmarish experience while visting Marsh Manor. A tremendous experience up until the very end, I'm glad to have borne witness to this adaptation. The Woman In Black (2012) - 3.5/5 - I was quite impressed with the ITV adaptation which I viewed the day before, so going into this one, I was a tad sceptical. While I find that to be the superior of the two, I I was rather impressed with the 2012 adaptation. James Watkins wisely chooses to focus on atmosphere over modern horrors need to ramp up the gore, and it's a tactic that pays off. Yes, it still pulls out jump scares which feel cheap, but the tension effectively builds throughout this ghostly chiller, to the point where I was questioning if the films 12a rating was a bit lenient. I've admired Daniel Radcliffe as an actor, especially his work post-Harry Potter, and he serves the role well here. He sells the inner turmoil of the character, although I question his characters inability to ask important questions about what's happening in the little town (brought to life by fantastic production design). His emotional arc is well served, even if I question the necessity of his last scene. Still, this was a nice surprise. Love, Simon - 4.5/5 - A touching and heartfelt tale of identity, friendship, and romance, in this landmark film. Truth or Dare - 0.5/5 - Bottom of the barrel is too kind for this rubbish. A Quiet Place [rewatch] - 4.5/5 - I took my non-horror loving girlfriend to see this in a mostly quiet cinema (of course there was someone rustling his popcorn throughout). She really liked it, and it led us to discussing it later after much time had passed. I'm glad I got to share this experience with her, and that I got to witness John Krasinski's tense piece of horror on the big screen once more. Ghostwatch - 5/5 - I had to give this one the full rating. I loved what I saw yesterday night, to the point it chilled me and I didn't want to move once it finished, but today, I realised how much of an impact this had on me. I was driving home from work in the wonderful sun, catching up on The Evolution of Horror podcast. Once they played a clip of Pipes, I got chills and shivered, an experience I haven't had since my first watch of The Texas Chain Saw Massacre. What Lesley Manning put onto BBC screens was a faux-live television show about ghostly experiences, proving utterly compelling and an undeniably tense experience. So much is done with what appears to be so little, making for something unnerving, unsettling, and downright unforgettable. Probably not as unforgettable an experience as the people who saw it on TV all those years ago (airing just 3 days prior to my birth), but it's one that shall not leave my memories anytime soon. Captain America: Civil War [rewatch] - 5/5 - Before the release of Avengers: Infinity War, I decided to revisit the entire MCU through the weekly rewatch that's been all over social media. Unfortunately, I fell too far behind, so I decided to ensure I rewatched this one at least. It remains a wonderfully told tale that eclipses its source material, allowing each character their own personal arc or moment to shine, while delivering scenes which feel ripped from comic book panels. Easily my favourite of the franchise, especially with how things play out in the final act. Avengers: Infinity War - 5/5 - A film 10 years in the making, and somehow, it manages to stick the landing. Avengers: Infinity War [rewatch] - 5/5 - It's astounding how fantastically this works upon a repeat viewing. The Russos have delivered a blockbuster that carries the expected action scenes, but is also full of emotion, gives each character their due (which remains a stunning task with this packed a cast), a great sense of humour, and refuses to compromise on the heavier moments. Avengers: Infinity War [rewatch] - 5/5 - It's easy to go back again and again to see this, when 149 minutes passes by in such a breezy manner. Josh Brolin remains tremendous as Thanos, and the hilarious moments pack their punch just as well on third viewing. Black Dynamite [rewatch] - 5/5 - This is a firm favourite spoof film of mine, clearly intended as a loving homage of the genre, and delivers the cliches in great succession. Michael Jai White remains hilarious in his portrayal of the eponymous Black Dynamite, the blaxploitation alpha male who kicks doors into old ladies, threatens those who sell drugs to the community, and doesn't want his Kung Fu interrupted. How is it after nearly 10 years of watching this, I never get bored of it all?